It is estimated that there are around 70 million people in the country suffering from Hepatitis B and for a majority of them, getting a clinical test to diagnose the illness can be expensive and time-consuming— Rs 15,000 for a test conducted by an expert and four or five hours for results to come through. To try to address this problem, Bigtec Labs, a subsidiary of Bangalore-based BigTech, has devised a handheld testing device that it claims can diagnose pathogens (for Hepatitis B) in just 10 minutes and, what’s better, do so at below Rs 100 per test. Size of target market: 200 million tests for Hepatitis B alone and 4-9 per cent of the Indian population is said to be hit by this illness. Compared to a conventional polymerase chain reaction (PCR) machine that costs around $30,000 (Rs 12 lakh) for a mid-market option and requires skilled technicians to operate, Bigtec’s bright yellow handheld will cost Rs 20,000 and can even be handled by staff at a primary health centre. With in-built Bluetooth connectivity, results from tests can be relayed anywhere, using cellphones or other mobile devices. “The biggest challenge was working across disciplines such as electronics, biology, chemistry and optics to shrink the product into a handheld,” says Chandrashekhar B. Nair, Director at Bigtec, whose three founders (J. Guru Dutt, G. Sampathgiri, and G.M. Kini) worked together in different combinations at various companies. “We started (testing the device) earlier this month and expect it to be ready for the market in eight to 10 weeks,” says Nair. Emboldened by the results, Bigtec, which received Rs 6 crore as seed fund from CSIR’s New Millennium Indian Technology Leadership Initiative (NMITLI), wants to develop cheaper devices for other diseases such as chikungunya and malaria. Then, it’s also in talks with partners both in North America and Europe (with two firms reportedly from the Netherlands) and plans to license its solutions to medical equipment makers. “We specialise in product development and want to leave the other parts to our business partners,” says Nair. The firm reckons it will need another Rs 40 crore to develop the new line of products. Are VCs listening? Madhukar Gangadi doesn’t wear an odd-size shirt (he is size 40), already runs a chain of medical stores called MedPlus, and is a medical doctor to boot. So, why on earth did he think of Zerostock Retail, a chain of stores that offer ready-made menswear in a wide range of sizes and designs to give the feel of near custom-made clothing? “I am more a businessman than a doctor and I have always been struck by the inefficiences in inventory management in retail apparel stores,” says Gangadi. 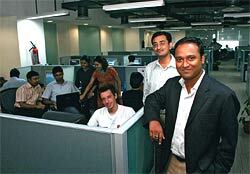 In 2007, he set up Zerostock and roped in long-time associate and Wharton co-alum, Ashok Mayya, to be the CEO. In February this year, they started opening the stores under the Cornerstone brand, and at last count, had 25 of them across seven cities in the country (Hyderabad, Bangalore, Pune, Cochin, Kolkata, Jaipur and Chennai). Here’s how the Zerostock model works: The stores (called CornerStone) keep no inventory but have a computer (to display the final look of the chosen garment), a range of shirts in 14 different sizes and a trial room. When a customer walks in, he selects his right fit and style. The chosen outfit is then couriered to the customer within 24 to 48 hours from a central warehouse. CornerStone’s cost advantage comes from the fact that it has no inventory, operates small stores (600 sq. ft, typically) and outsources manufacture. “The footfalls, interest, repeat purchases and revenues are more than double of what they were when we officially launched on February 21, 2008,” says Mayya. 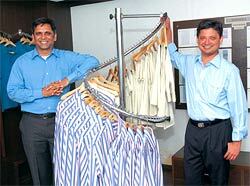 Their growth target: 1,000 stores by march 2011. In sharp contrast to the chaos on the ground floor of Manipal Hospital on Bangalore’s Airport Road, the ninth floor of the building, housing Stempeutics, a stem cell research firm, is an oasis of calm. Behind thick wooden doors, some 20-odd researchers and scientists are busy with their work, unmindful of an impromptu tour by B.N. Manohar, the firm’s President and six-and-a-half-year veteran of Manipal Education and Management Group (MEMG). Backed by a Rs 50-crore funding from MEMG, Manohar, an engineer by training, who also started the group’s distance education initiatives, is now looking to make Stempeutics the best-known name in stem cell research in the country. The global market for stem cell research and products is estimated to be around $10 billion and it is estimated that there are at least 1,000 clinical trials ongoing globally, with 134 treatments notched up using stem cell therapy. Eventually, Manohar hopes to have over-thecounter products available for the treatment of both life-threatening diseases across cardiac and neurological ailments. Before that, it hopes to use stem cell products to mimic serious illnesses and help pharma companies more accurately (and more cheaply) test the efficacy of their products. Currently, Stempeutics focusses on deriving stem cells from bone marrow and using them to begin research on their different product lines (it’s awaiting government approval). “We have eight research groups at Stempeutics and we will take another 8-10 years before we can reach the therapy stage,” says Manohar. According to him, the focus is on replicating what happens in vivo (in the human body) to in vitro (in a research lab), and hopefully discovering cures for many debilitating illnesses such as Parkinson’s and Alzheimer’s, which require the rapid replication of healthy cells. Meanwhile, Stempeutics has opened a facility in Malaysia and has been the first in that country to get the Bionexus status, which entitles it to financial incentives such as tax breaks. It operates in a space that is already inundated with small and big players. So, what makes iXiGO stand out enough for us to cherry pick it for our list this year of hottest start-ups? “The dominant model in the online world is driven by search and not by transaction platform and that’s why we didn’t start yet another travel portal. We want to become the Google of travel searches in India,” says Aloke Bajpai, Chief Executive Officer, iXiGO. In other words, iXiGO is not a travel website but it helps users search for air fares and hotel tariffs. When a user clicks on a search result on iXiGO, he is taken to the website of the concerned airline or travel agency to complete the transaction. “This also means that the user doesn’t need to write down the prices, timings and other details before comparing all the offers on iXiGO,” explains Bajpai, 27, who co-founded the portal with a team of four former colleagues and friends. The idea of iXiGO, Bajpai says, came about in 2005 when the four young men decided to leverage their experiences in travel, technology and online space. “And after months of ideation, research and testing, we finally launched iXiGO in June last year,” says Dharmendra Yashovardhan, COO, iXiGO. 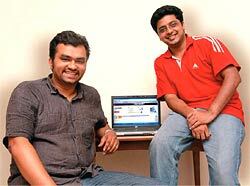 The company got its first round of funding from Singapore-based angel investment firm BAF Spectrum in February 2008. For revenue, iXiGO, which recently added hotel search, is looking at both referral fees from 12 domestic airlines and over 35 OTAs (online travel agencies) for directing the right kind of traffic to their portals as well as CPC (cost per click) and CPA (cost per acquisition) advertising, which would be displayed along with the search results. At present, iXiGO claims to process around 25,000 searches a day with almost 500 of them resulting in sale. Bajpai expects searches to touch 100,000 a day in the next one year. Do you want to predict if wedding bells would ring for Ness Wadia and Preity Zinta in 2008? Or, if Sachin Tendulkar and Saurav Ganguly are likely to end their one-day international careers in 2008? If yes, then log on to www.lordsofodds.com, a Pune based start-up that allows visitors to predict events and ‘trade’ in them. Started in early 2007 by Rajesh Kallidumbil and Hariharan K. (both engineers and IIM grads), the site lets visitors predict in fields as varied as sports, politics and entertainment. “Basically, we met through a common friend,” says Hariharan, comfortably ensconced in a beanbag at his apartment that he shares with Rajesh. “I am very passionate about sports. And Rajesh (during his stint with ICICI Bank’s Treasury Department in London) was exposed to the concept of prediction markets and organised betting in London. So, we decided to start something similar in India,” says Hariharan. The site itself was launched for the public barely a month ago. “At present, we have no institutional funding. All the money we have raised is from friends, family or our own. We are looking to raise funds,” says Kallidumbil. Since betting isn’t legal in India, the company hopes to drive traffic to the site with targeted online advertising. “Our revenue model will largely revolve around internet advertising and getting companies to sponsor certain sections or particular prediction categories. For example, the Indian Premier League (IPL)-related predictions can be sponsored by a company that wants to be associated with the game,” says Hariharan. On the anvil is a mobile game that will allow users to make predictions. At present, Lords of Odds employs about three full-time employees. The company also plans to hire more employees, including an editor, whose job would include finding new areas and statements on which people can make predictions. Any bets on whether Kallidumbil and Hariharan’s idea will fly? 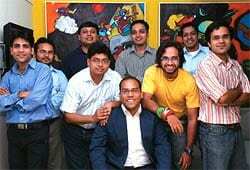 It was at one of their regular evenings-out in Bangalore that Krishnan N. unveiled his startup plans to his six friends. It was July 2007 and Krishnan was still Director (Finance & Operations) at Open Clovis, a US-based IT company, but he had been thinking of striking out on his own and wanted to put together a good team. His friends, who worked in different companies, liked the idea and Ikya Human Capital Solutions was formally incorporated in October, 2007. And what a fairy tale Ikya is proving to be. Key competitors: Ma Foi, Ranstad, Manpower Consultants. In the first three months of its operations, Ikya, which provides staffing, recruiting, search and learning solutions, reported Rs 35 crore in revenues and broke even. It has 11 offices in eight cities and another 12 cities on its radar. It started with 175 full-time employees but intends to add another 350. It’s also eyeing a Bangalore-based facility management firm for a possible acquisition. What drives Ikya’s blistering growth? The fact that its 14 founders came with a set of client relationships that the start-up could tap to get off the ground quickly. “In my 20 years of career in different companies, I always headed HR and worked with all of them (the founders),” says Krishnan. Adds Gaurav Mathur, MD, India Equity Partners, which has invested $8 million in Ikya: “The team at Ikya has a proven track record, and in a short period, it has proven that it is not only a competent player but a strong organisation to reckon with." 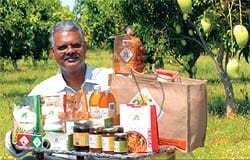 Buoyed by its success, Ikya, which counts L&T, Toyota, Vodafone and Future Group among its clients, is aiming big—perhaps, too big—when it says it is targeting Rs 1,000 crore in revenues by March 2012. “Our core strength is our flexibility in offering clientspecific solutions and use of technology in devising that,” says Romesh Advani, Chief Operating Officer. Look at it another way: What’s the point if you are a startup and can’t dream big? It’s a classic start-up story: Two brainy engineers start work on a project, find that it has commercial potential, shake themselves up for start-up money (one sells his paintings and the other dips into his stipend) and come up with an application that works. 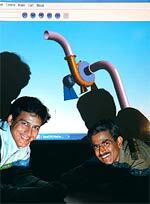 That, in short, is the story of how Bikash Barai and Nilanjan De thought of iViz while studying at IIT Kharagpur. Two-anda-half years down the road, Barai and De run India’s only on-demand network security firm. “We always wanted to do something different and something on our own. While working on Network Security and Simulation of Ethical Hackers (their project), we found the deficiencies in the existing system or solutions available. We thought if we could take care of these deficiencies, we could stand out. That thinking was the beginning of iViz,” says Barai. Barai, who is also a painter, is already credited with several innovations in the area of network security and anti-spam technologies and has filed for patents under his name. De’s expertise is in vulnerability research and exploitation techniques, network security, and kernel security. To get started, Barai and De took up a pilot project worth $1,000 from a US-based company called eRev-Max. The client was so impressed with their work that it ended up angel investing in iViz. With this investment, iViz built a team and finally took the product to market. The technology proved to be an eye opener for several governments as well as non-government organisations. In January this year, IDG Ventures invested $2.5 million in iViz. Last year, the Kolkata-based startup had revenues of Rs 60–65 lakh, but expects to do an impressive Rs 8-10 crore this financial year. “But more than these figures, we want to be the global leader in the field of penetration testing/security testing,” says Barai. Just the sort of stretch target a start-up needs. The current 3D technology, while very good, suffers from a simple problem: 3D files work best on powerful computers. That means your humble mobile phone, which is increasingly the first computer for millions of Indians, can’t let you browse through 3D objects. But Bangalore based start-up called 3D Solid Compression (3DSoC) is out to change that. A spin-off from an Indian Institute of Science and Stanford tie-up, 3DSoC uses a patented technology (called VIS) that allows lightweight 3D representation of geometry, text, sound, animation, textures and interaction. “When we started the project, there was a dire need to exchange 3D models from one region to another from research point of view,” explains Krishnan Ramaswami, who co-wrote the software with Stanford professor Fritz B. Prinz. “What we have now achieved is that we can reduce the file size of our own 3D models 1,000 times over as compared to a normal file,’’ he adds. Started off as a research project almost a decade ago, 3DSoC matured into a full-blown commercial venture in the last yearand-a-half. Besides Ramaswami and Prinz, Prof. B. Gurumoorthy, Chairman of Centre for Product Design and Manufacturing at IISc, and K.K. 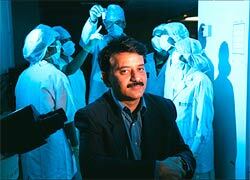 Venkatraman—Krishnan’s classmate at IISc—are the promoters of the company. While Venkatraman is the CEO, Ramaswami is the Chief Technology Officer. In the first year of operations that ended March 31, 2008, 3DSoC posted modest revenues of $50,000, and hopes to net $1 million this year. The startup’s rapid growth is explained by the fact that it has no local competitors and the market is almost virgin. “There are a few start-ups globally but none here in India. If we meet 10 customers, nine close the deal,’’ says Krishnan, adding how every customer they come across is excited by the awesome range of applications their technology can provide. Bajaj Auto, Sundaram-Clayton, and Triveni Engineering are some of its clients. And while IDG Ventures is already an inventor in 3DSoC, it wouldn’t be surprising if there are other VCs keen to get a piece of this heavyweight of lightweight 3D. Talk about focus. 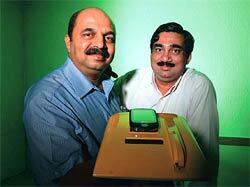 As long as Kami Narayan and Kapil Viswanathan can remember, they always wanted to be entrepreneurs. “We were also clear that it had to be a cross-border enterprise,” says the duo of brother and sister. So, when the scions of Chennai’s “Enfield family” (their father, Late S. Viswanathan, was former Chairman of the company) spotted an opportunity in publishing, they grabbed it. In August 2005, Kapil, an MBA from Harvard, put together a team of six people and launched PreMedia Global, a publishing outsourcing firm. Last year (2007-08), PreMedia raked in Rs 70 crore in revenues. Key competitors: Cenveo Inc; Innodata Isogen. What clicked? “Publishers wanted key capabilities onsite and offshore clubbed with a strong technology back-up all under a single head. That’s what we decided to do,’’ says Kapil, who earlier worked with Tata Consultancy Services as head of global sales for one of its verticals. Just the same, finding customers initially was difficult, but the siblings persisted. Kami, a gold medalist from the National Law School and also a Harvard Business School alumna, had earlier worked with Chennai-based BPO, Office Tiger, as head of its M&A team, and Arthur Andersen, where she worked in the business advisory practice. The siblings’ combined experience came handy, and they quickly moved into the acquisition mode. Beacon Publishing, an Ohio-based technology firm, was acquired in March 2006, followed by Utahbased Westwords Inc. in August that year. Prepress Inc. of Massachusetts was bought in January 2007. 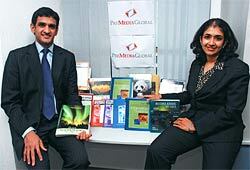 Then, in March this year, PreMedia acquired GGS Book Services, which helps design and develop school text books. “We grew (PreMedia) simultaneously through the organic and inorganic route,’’ says Kami. 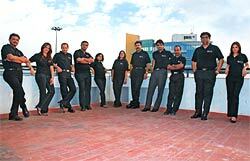 In 2008-09, the firm hopes to do Rs 150 crore in revenues.